The small business tax changes introduced by the Canadian Government were a communications and policy failure that required significant back-tracking by the government. In simple terms, the government sought to restrict income splitting and to prevent individuals from using the tax benefits of corporations to save and grow assets. While the overall message of tax fairness likely resonated with Canadians and the Liberal base in particular, Morneau, as a rich business person, was a poor messenger and the failed communication along with Morneau’s own ethical lapses set up the opposition and media to transition the story from policy to personal. But the policy story from a public opinion perspective is one where Canadians were weakly engaged and while supportive, they were not strongly attached to an outcome. Nine polls between September 1 and early November addressed the tax issue. The first by Mainstreet was more focused on the tax fairness issue and clearly posed the question of whether certain groups were paying their fair share of taxes along with the presence of loopholes. 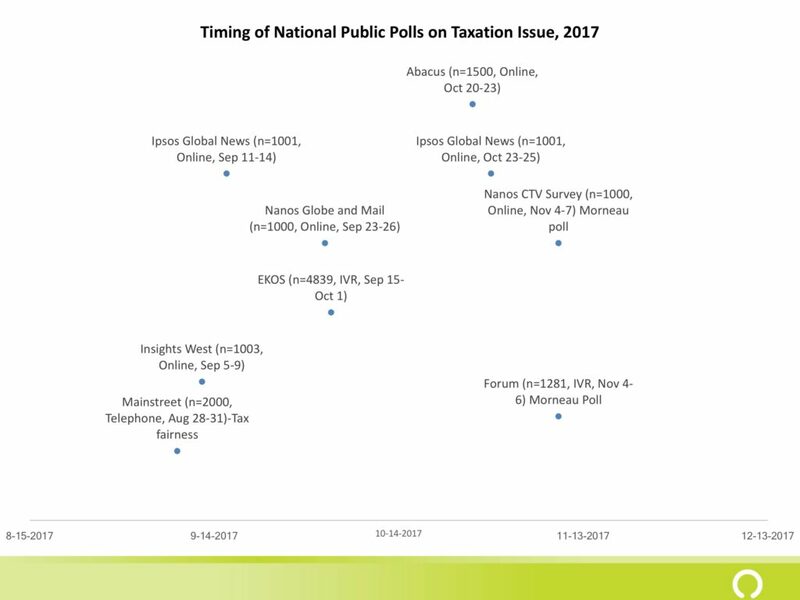 By mid-September, polls clearly focused more on the overall politics of the issue and the potential fall out for the Liberals before turning most clearly, two questions about Morneau himself. 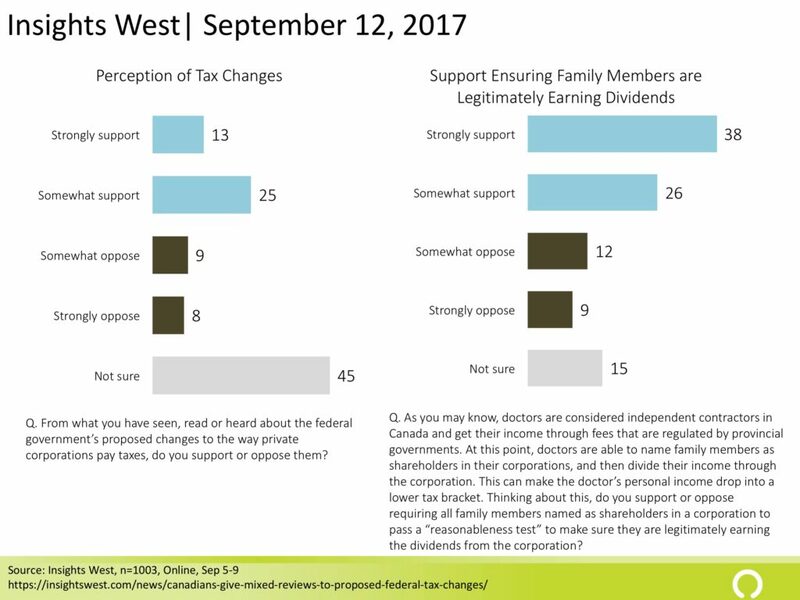 While these latter polls, clearly reflect the broader issues raised by conflict of interest and ethical judgments, the closeness to the tax change issue, which was being led by Morneau suggest we should think of them as the extension of the tax change issue. As a policy issue, the small business tax changes were going to be a high profile issue for the government. Small business owners are well organized and represented by associations and they are generally well connected in terms of knowing their MPs. So while Canadians in general might have little interest, the government should have expected push back. The botched communications and overall understanding of how this issue would be received by these groups contributed to giving the issue more legs than it would have had. Communication which focused on tax fairness might have resonated with the public — and there is evidence that it would — it was unlikely to sway opponents. About four in ten Canadians were paying attention to the issue but most were not doing so closely. In September, an Ipsos Global News poll found that only 8% were following the issue very closely and an Insights West poll similarly found 10% were following very closely. A later Ipsos Global News October poll found 6% were closely following the discussion and at the end of October, Abacus found 7% were following the issue closely. All four polls across a two month span effectively reached the same observation which supports one conclusion. The small minority who were following the issue closely and, therefore, expected to have a good grasp of the arguments were unlikely to dramatically impact assessments of the government in the broader public. Those who were paying less attention, even those who were somewhat closely following the discussion, were likely to be less impacted by the debate. In the absence of attention people would be expected to react to the issue using a partisan filter. It turns out that they used cues about tax fairness and partisanship to derive their opinions on these issues. 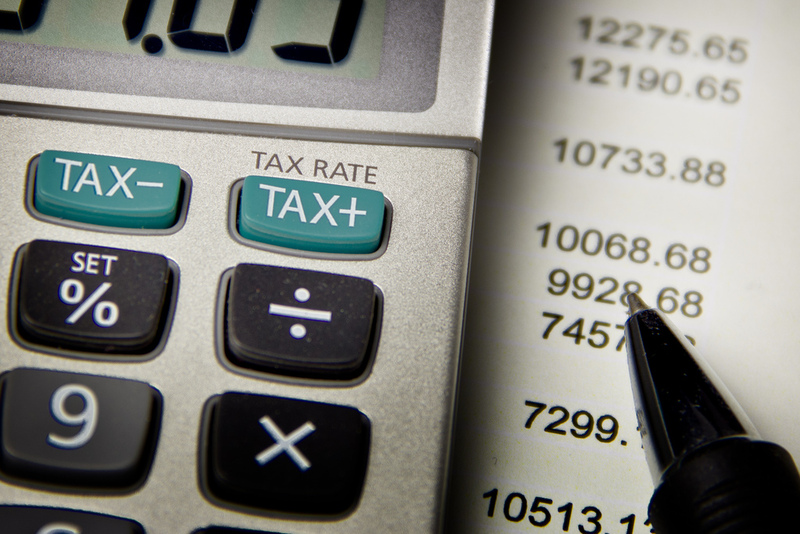 The small business tax issue is complex and did not directly impact on most Canadians. The chart below highlight the level of support in four separate polls. 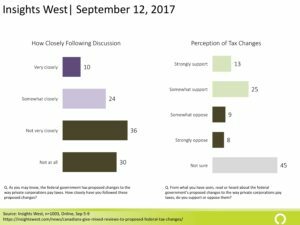 Insight West found that 38% either strongly or somewhat supported the proposed changes to how private corporations pay tax. The question largely relied on respondents to fill in the blanks in terms of what the changes were and why they were necessary. A total of 45% were not sure if they supported or not the changes. 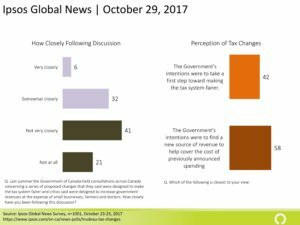 Just over half of Canadians (56%) supported the tax changes in the September Ipsos Global News poll. The aim of the tax changes as described to respondents was “to reduce the ability of small businesses, including doctors and other professionals, to reduce the amount of tax they pay” through incorporating as a business. While there was majority support, only 9% strongly supported the change. 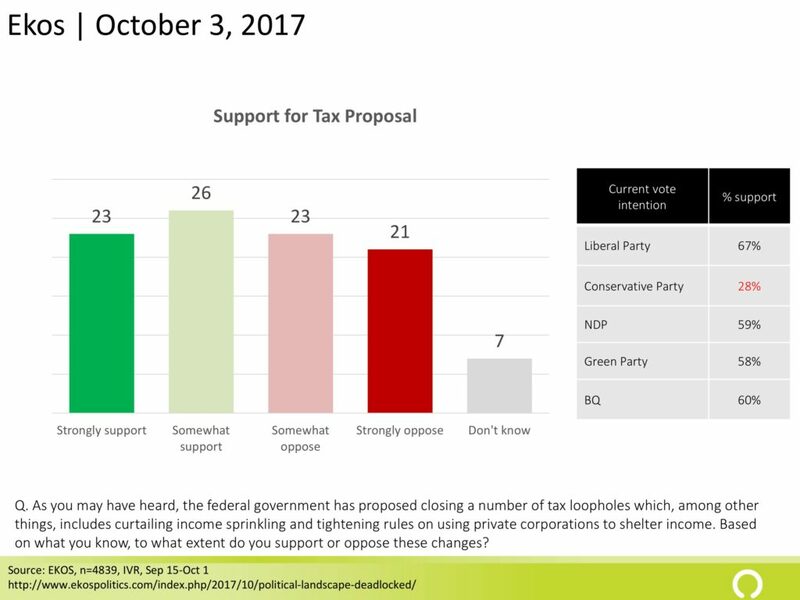 An Ekos poll fit in between the Ipsos and Insight West polls; it found that 49% somewhat or strongly support the government policy [Question text: “As you may have heard, the federal government has proposed closing a number of tax loopholes which, among other things, includes curtailing income sprinkling and tightening rules on using private corporations to shelter income. 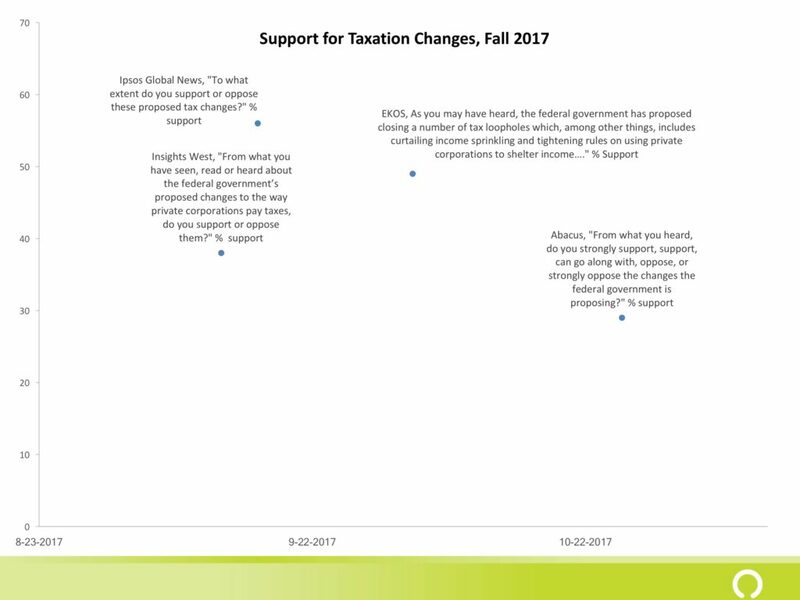 Based on what you know, to what extent do you support or oppose these changes?”] Clearly this question contained more policy content that related to the tax fairness angle. 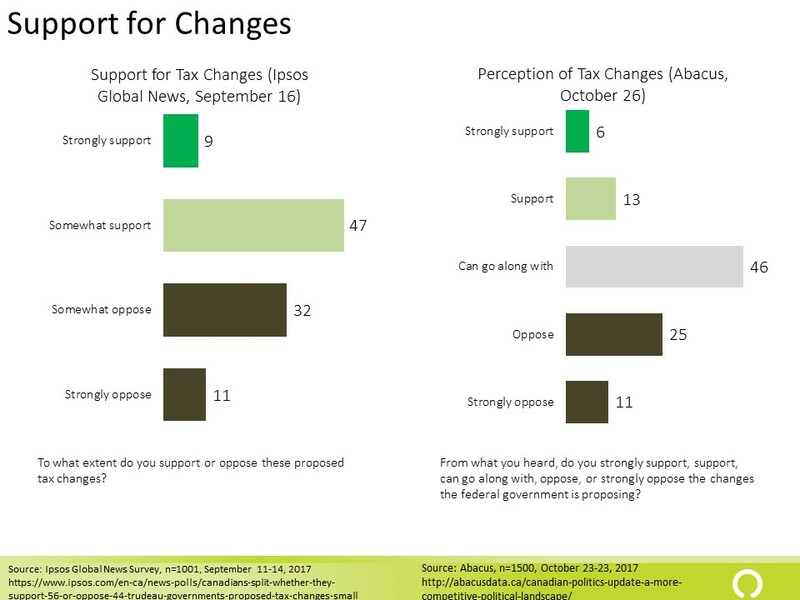 A later Abacus Poll also found tepid support for the change; 29% either strongly support or support the changes versus 36% who opposed them. Most Canadians (46%) would go along with them, presumably because the impact would be small to zero on them personally. It would be great if we had some common questions asked across the surveys this fall but the variation in question wordings is instructive regardless. Allowing respondents to answer they can “go along with it” in the Abacus poll allowed, it appears, people who are not very certain or do not care to express their indifference. Once allowed there was a lot of indifference. Few people answer strongly support to the questions, except in the case of the Ekos poll, which is the only question of the four that explicitly mentioned loopholes. The opposition was higher than support in a number of polls, including the Ipsos Global News poll released September 16th and the Abacus poll. 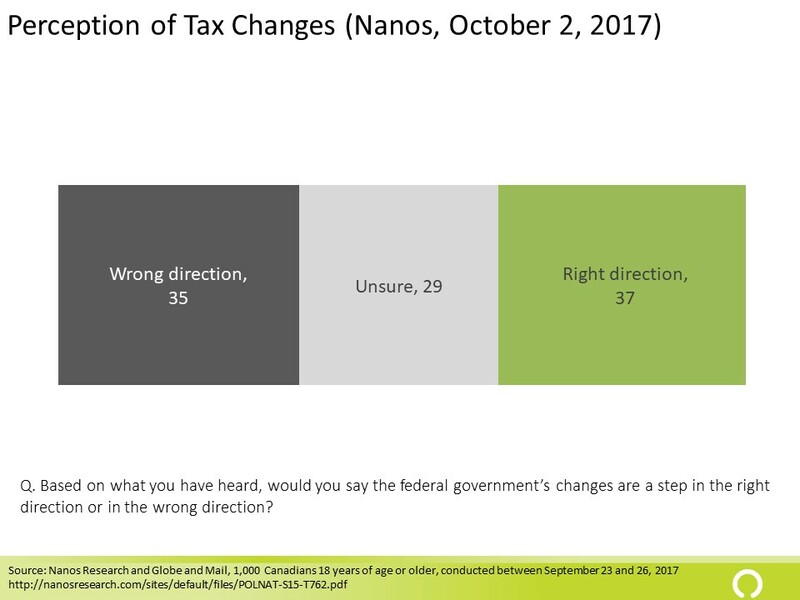 A Nanos Research Poll in October found a divided population with 37% believing the changes were in the right direction and an almost equal number viewing them as in the wrong direction (35%). This is not surprising when one probes some of the specific changes. 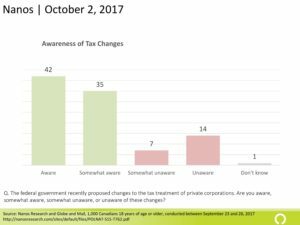 56% of Canadians oppose allowing owners of small corporations to slit income to reduce taxes paid. 48% think small business owners should be able to invest and earn money within their private corporation. 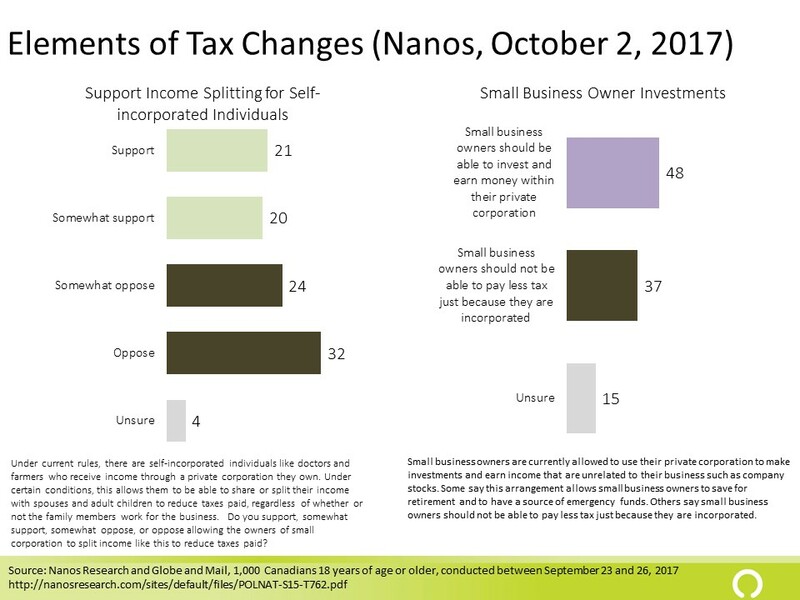 The Nanos survey points to the fact that the income splitting was viewed negatively, probably because it feels unfair, whereas the idea that businesses could earn income and pay lower taxes was not viewed as a problem by as many Canadians. Partisan differences were not strong indicators, except in that 2015 NDP voters were the most likely to somewhat or strongly support (70%) changes that would require a reasonableness test. That said, 60% of 2015 Conservative voters wanted to ensure income sprinkling was “reasonable.” The tax fairness cut across political lines to some degree. The Ekos question clearly did fall along partisan lines with Liberals supporting and Conservative’s opposing the question. Of course, the Ekos question clearly presents this as a federal proposal, so the lesson here is that the more proposals are framed as government issues the more partisan the polling results will be (at least in this case where engagement and actual impact on the public are relatively low). The small business tax issue flared up and became a significant agenda issue in ways that had the government on its heels. Doctors and other self-employed Canadians were angered by the tax changes and significant opposition emerged. Most of this was a poor communication and poor policy. Appealing to tax fairness makes sense as a justification for a Liberal government trying to appeal to its base, but the overall policy issues was complex. 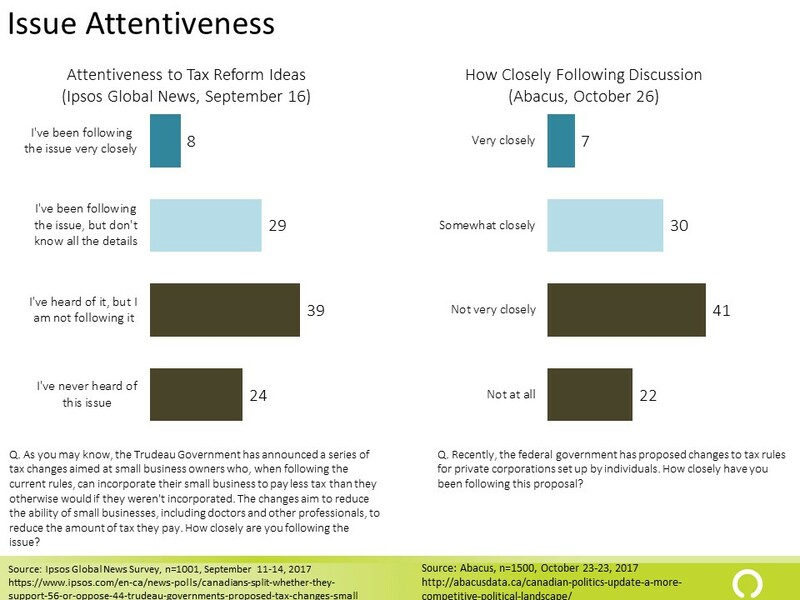 In the absence of cues that made the issue clearly about tax fairness, such as references to income splitting, support for the Liberal agenda on taxation of small businesses was weak. Combined with the relatively low attention to the issue, the fallout for the governing Liberals would be expected to be small in direct terms from a mass public point of view. The issue did, however, undermine the Minister and provided the perfect set up for an attack on his own credibility. Next article[CORA Archive] Are you a feminist?